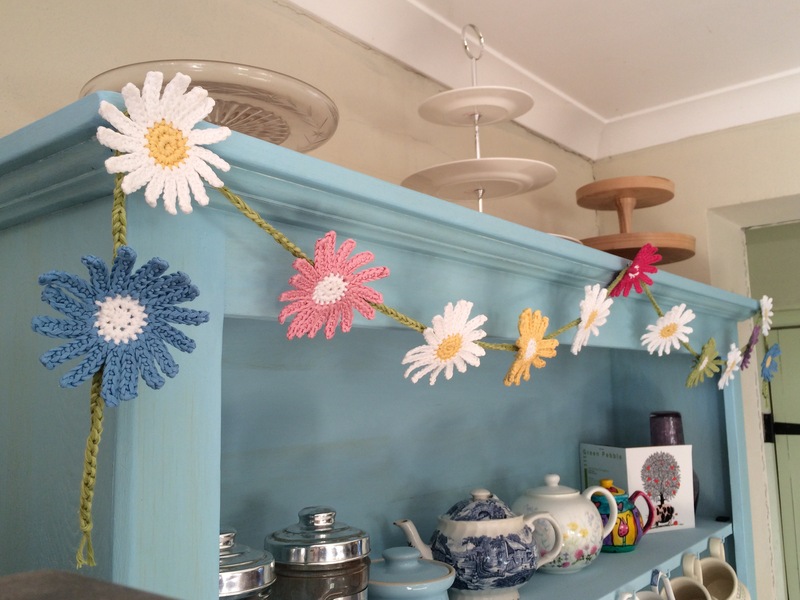 If you follow Kate of Just Pootling blog, you’ll be familiar with her lovely crocheted garlands. 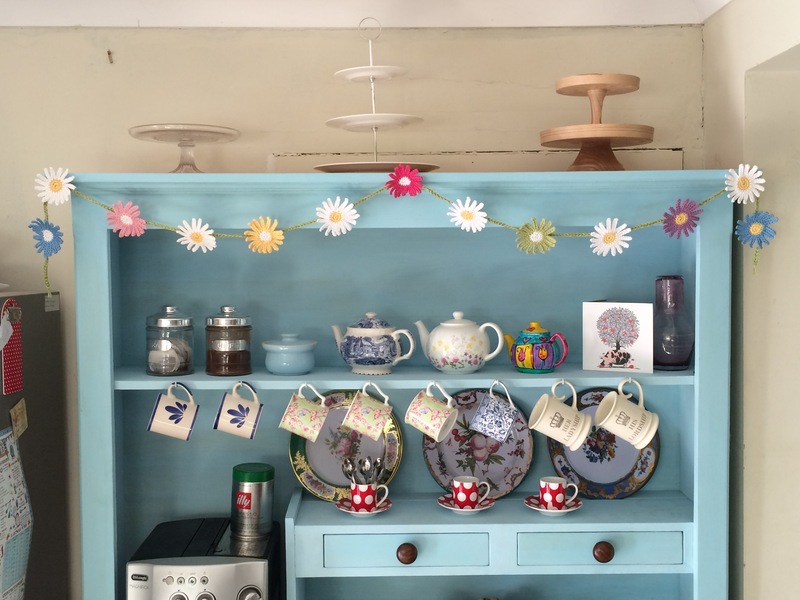 As soon as I saw her Late Summer Daisy Garland, I knew that I’d have to make my own version for our newly upcycled kitchen dresser. 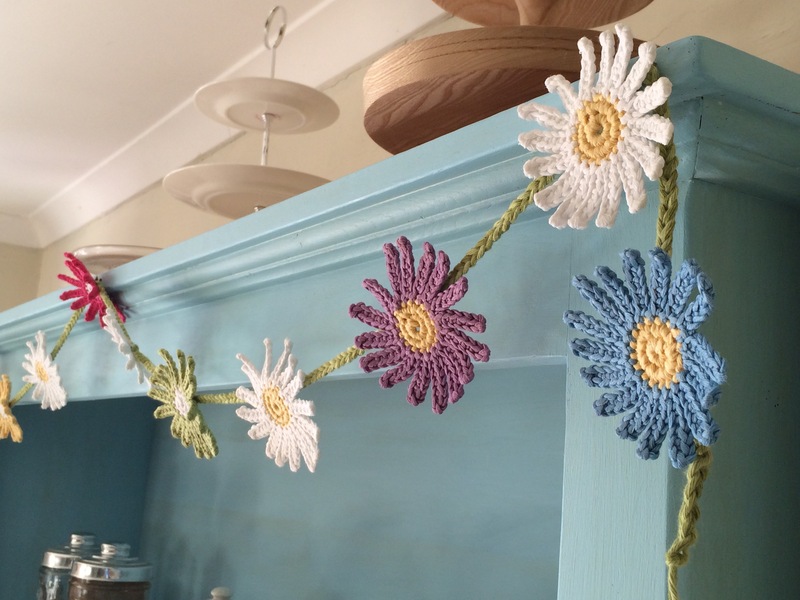 I have lots of suitable cottons already, in a whole range of colours, so thought it would be fun to make a multi-coloured daisy garland. I followed Kate’s instructions, which can be found by following this link. Each daisy took about twenty-five minutes to create, so I just made a few as and when I could fit them in over the course of a few weeks. 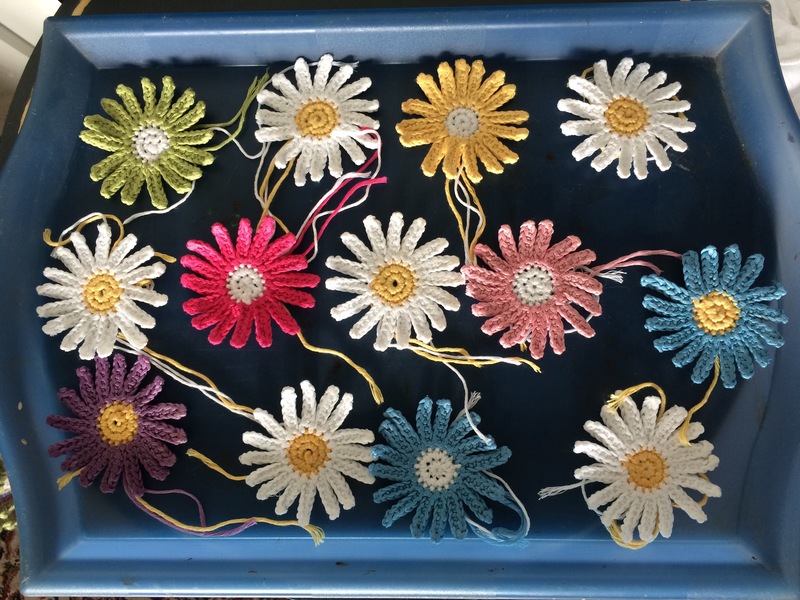 I made thirteen daisies in total – seven coloured ones and six white ones, so that every other daisy on the garland would be white. This shows what a difference blocking makes! I actually used spray starch and an iron to block the daisies, which is very quick and means the daisies are slightly stiff so should hold their shape without flopping. 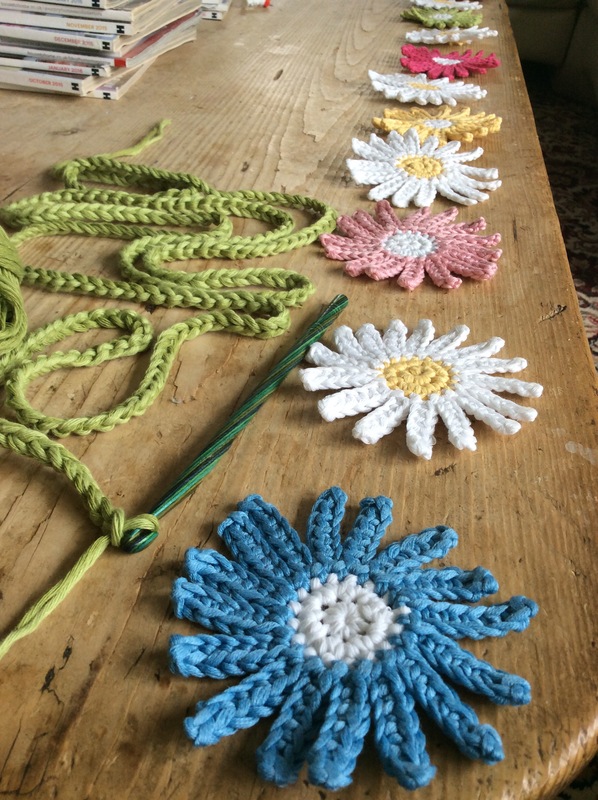 I opted for a simple chain stitch cord on which to mount the daisies and continued crocheting, measuring as I went, until the chain was long enough. 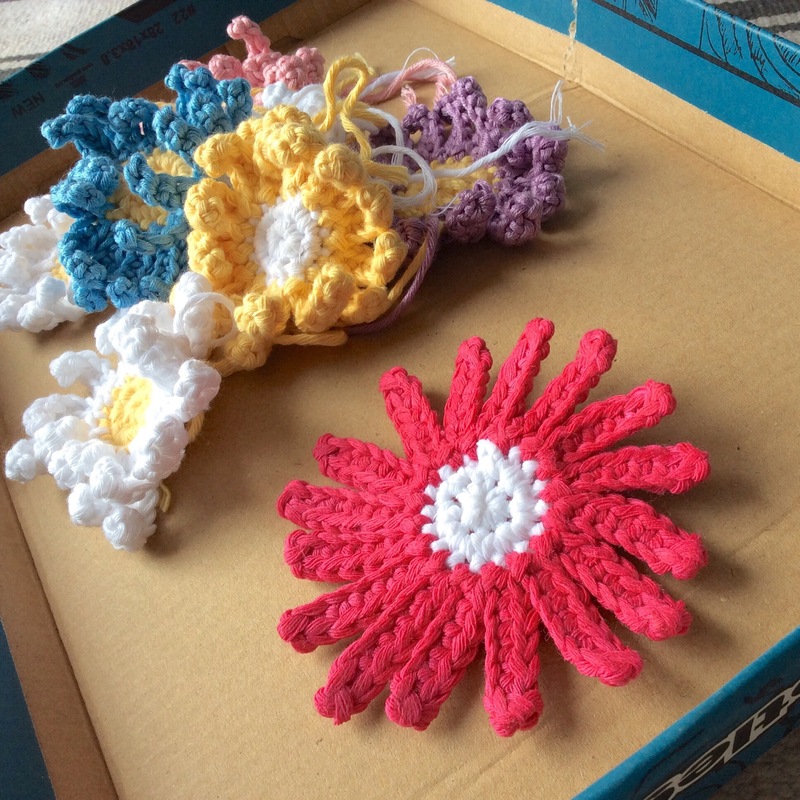 The daisies were spaced three inches apart with a three inch tail at either end and simply sewn on to the crocheted chain. A hook was screwed into the dresser at either end and another in the centre, then the garland was hung. Isn’t it pretty? The perfect finishing touch, I reckon. 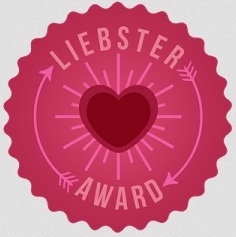 My friend loves it so much that she asked me to make one for her. Why aren’t there ever enough hours in the day…..? 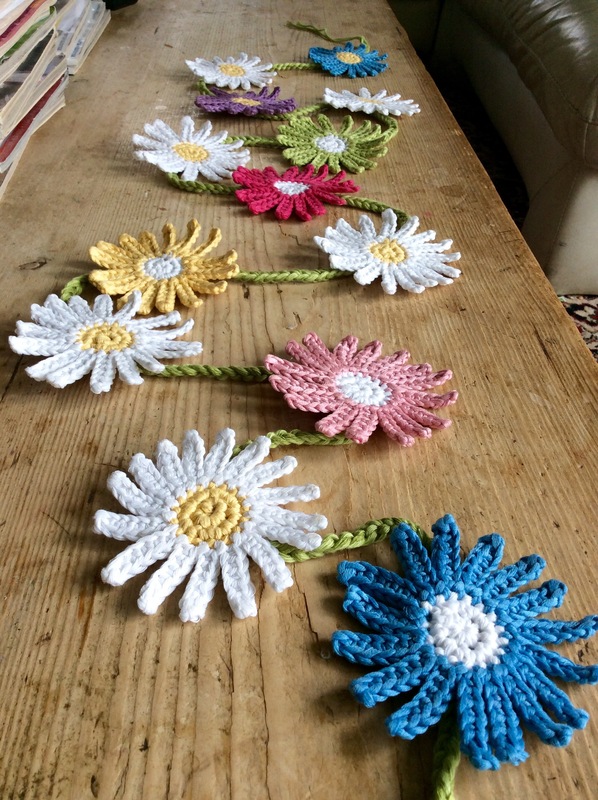 Categories: Crochet | Tags: crochet, daisies, daisy, flowers, garland | Permalink. So pretty! Adorns your dresser beautifully. Thank you, it’s the perfect finishing touch, isn’t it? 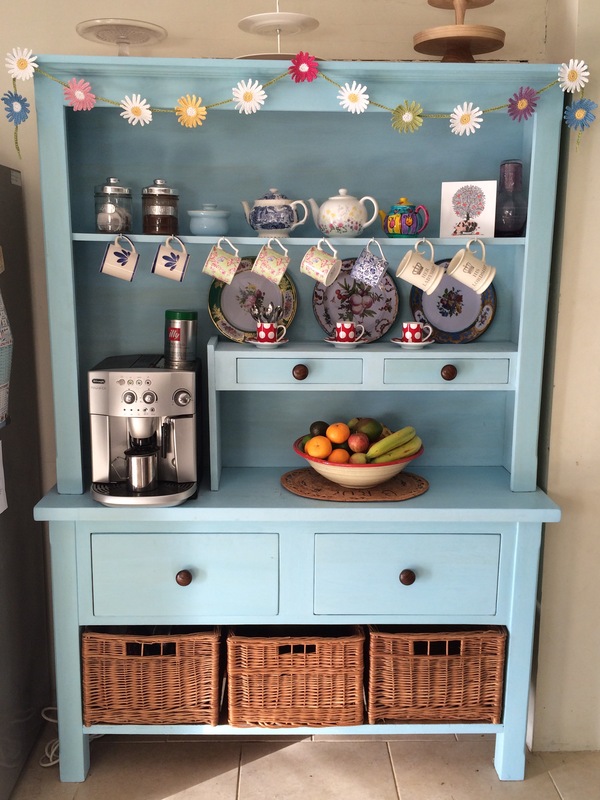 Thank you and you’re right – the dresser is complete and no more adornment is required! Well, we got an extra hour this morning when the clocks went back…..! Your garland is precious. I love how it looks on your dresser. It is just perfect. Great job! 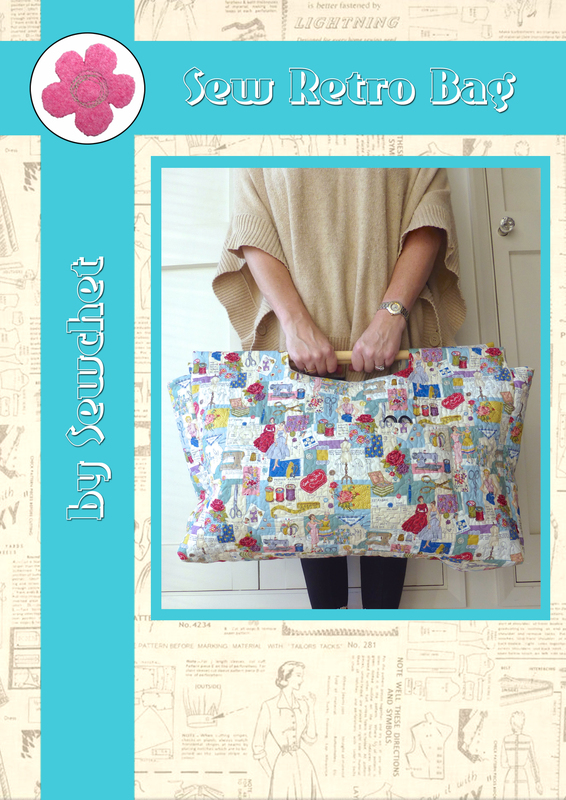 Thank you, it’s a lovely pattern , isn’t it? 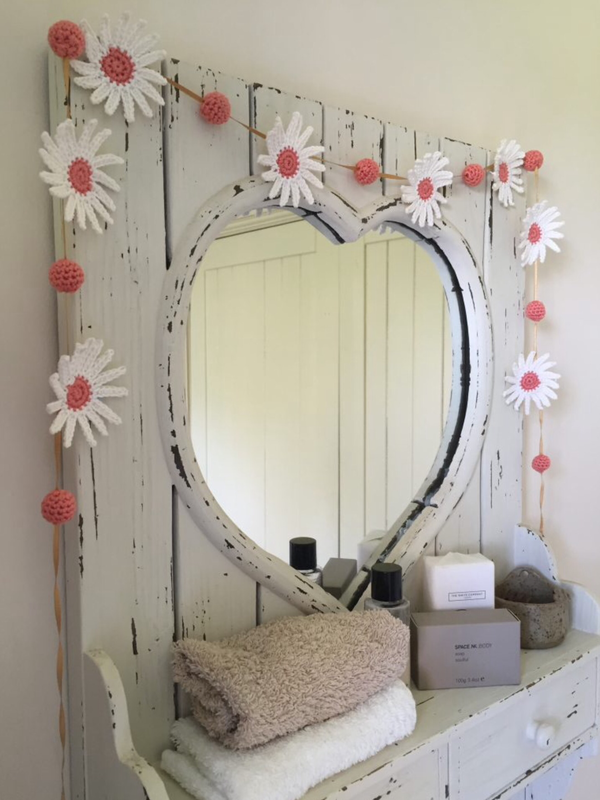 Thank you:) You could also try painting the back of the daisies with PVA glue, which works well, apparently. I know, I could put these in every room if I could get away with it! This is one of those times I wish I could re-learn crochet. Do I need another hobby in my life I ask myself. What a lovely idea. 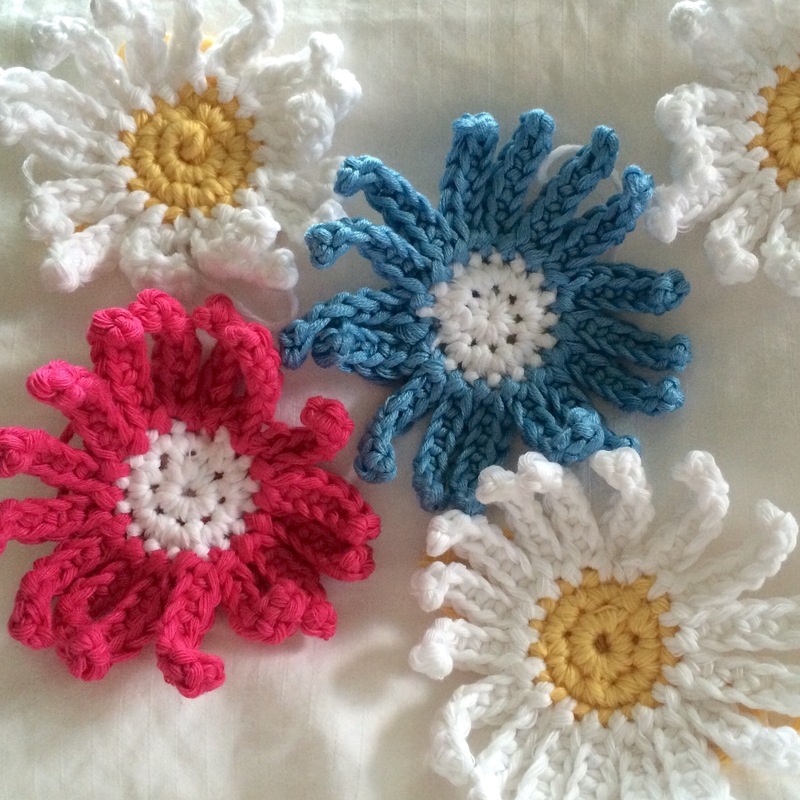 I love crochet daisies. They’re so pretty. Think I might just make garland for my dresser once I’ve this week over with. Thanks for inspiring me. Ooh, you will show us if you do make a garland for your dresser, I hope! It looks great. I plan to make something similar for my dresser (unfortunately there’s not enough time to make all the things I want to). Tell me about it – never enough hours in the day, even though we had an extra one this morning! That’s so pretty Sheila, I keep meaning to make some garlands too, especially the a Just Pootling one. One day…. Thank you, Kate makes some lovely garlands, doesn’t she? It is just perfect. I am adding this to my “to do” list. Thank you for all the links and photos. It really suits the dresser, and is the perfect personal touch. 🙂 Love it! Thank you, hopefully we’ll see your version before too long. 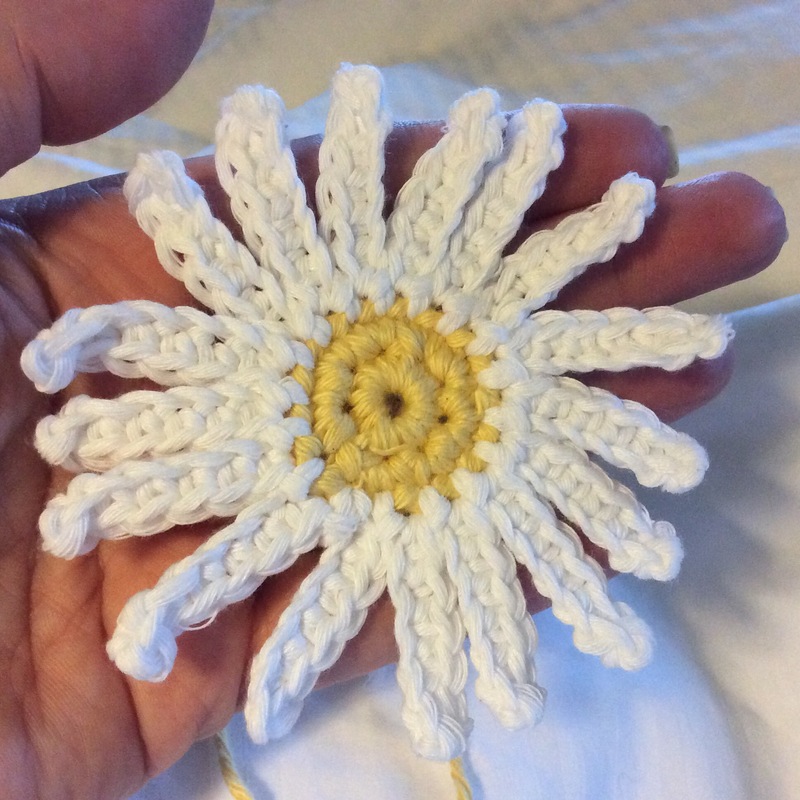 Oh goodness, how can something so simple (says she who cannot crochet) be so smashing?? It’s lovely! 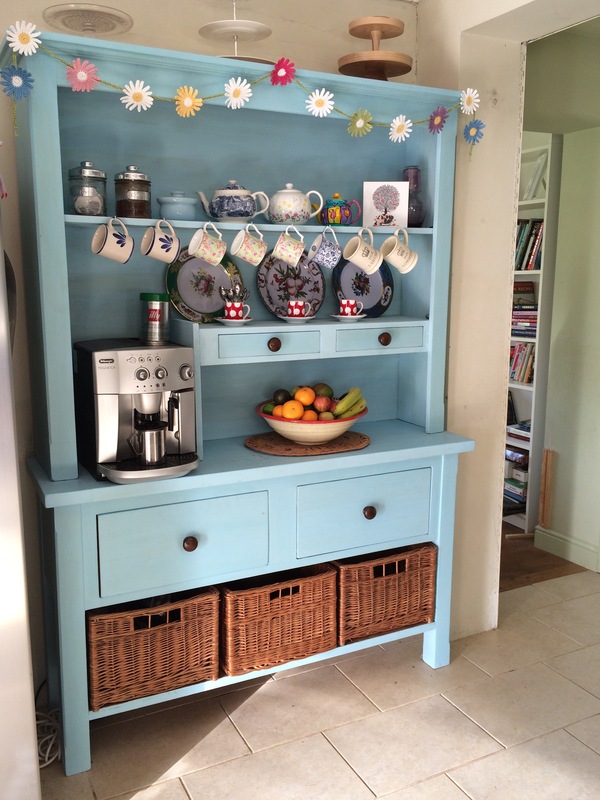 What a cheerful adornment for your coffee hutch. I like that they’re in a variety of colors, too. 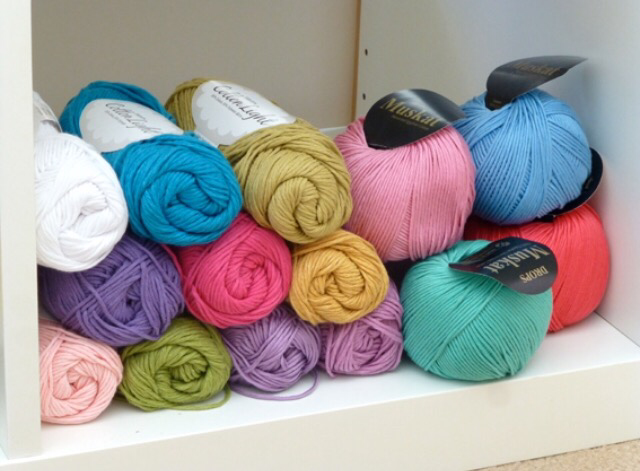 Thanks Alys, I couldn’t choose a favourite colour so I just used them all!